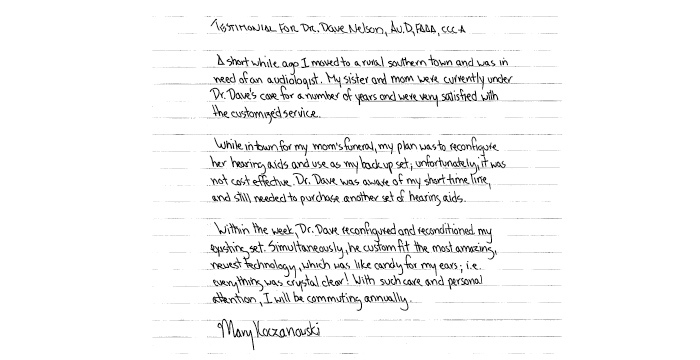 Dear Dr. Dave, I just want to say thank you for making the hearing aid available for me. My life without it is very quiet. As soon as I insert my hearing aid in my ear, my life is back. What a blesing to be reconnected with my family and friend and this busy world! Thank you! Thank you! Audiology Service Associates - On behalf of my brother Joe and myself I would like to thank Dr. D. Nelson and his associate Lisa for their gracious time and effort in adjusting hearing aids for my wheelchair bound borther (Joseph Czyrny). They both went out of their usual work to do this. My sincere thanks. Dear David, although I have problems with my hearing aid, I feel lucky that you are my adviser, because I trust you to have my best interest at heart. I can sense, that you sincerely want to make me feel comfortable and select a hearing aid that will satisfy my needs and is the right hearing aid for my loss of hearing and my numbness in my hands. Loss of hearing is a very personal experience and needs mental as well as physical adjustments to cope with this age-related condition. Thank you for your patience. Wish you and your family a joyous Christmas and a good, happy and healthy New Year! I have been a patient of Dr. David Nelson, of Audiology Services, for over two decades. Based on my personal recommendation, my Aunt and Sister are also his patients. I have been able to continue my career as an Instrumental Music Teacher over the years, due in large part, to Dr. Nelson's cutting edge expertise and personalized care. As par for the course at Audiology Services, not only are the newest set of hearing aids cleaned and maintained at a semi-annual appointment, but additional maintenance effort is performed on the old set in house, to prolong their functionality as a back-up. But perhaps my greatest testimonial to Dr. Nelson and his staff, took place after my most recent semi-annual appointment, on a Friday. At that time it was determined my still-under-warranty hearing aids needed repair by the manufacturer; i.e. outside of the office. They were then promptly sent out by Audiology Services Staff, with a projected turn-around time of two weeks. On Tuesday, my Mother quite unexpectedly passed away, and simultaneously my back-up hearing aids malfunctioned. With numerous upcoming appointments in order to plan the funeral, I called Dr. Nelson in a panic. My fervent request: to have my hearing aids returned from the manufacturer in any condition, as soon as possible. My hearing aids were returned pronto, and to my great surprise, in full repair!! Dr. Nelson literally "moved the mountain", for me and to me. Thank you, Dr. Nelson and Staff, for all you do, so very, very well. Hi! I'm Charlie Greene, and have worn hearing instruments for 20 years. In the beginning I thought people were just talking too fast and not loud enough. I was dead wrong. The hearing aid turned my career around and made major improvements in my social life. Each generation of hearing aids is a quantum leap in performance, comfort and features, and my experiences with Phonak and Oticon were great for the state of the art for that generation of development. The ReSound LiNX are my 5th pair of hearing aids and are the best yet! They not only provided the best hearing compensation that I've experienced, but introduced me to the new world of the iPhone. This past year has been a trip. Between family in the hospital multiple times, and the tragic road through Hospice, the ReSound hearing aids made every word spoken hearable and more precious than ever. The versatility and control of the instruments are totally provided through the iPhone 5c. The ReSound app is deceptively powerful. The controls are very simple and intuitive to use. You have control for the volume, tone and event programs for noise, music, etc... The fun never ends! There are "gadgets" available that allows you to use your home phone and to be able to hear the TV sound independent of the speaker volume... and much more. One of the great engineering designs is the modular construction that allows the staff at ASA to insert new components and repair the units on the spot which greatly reduces the average repair time. But most important of all is the expertise, knowledge, professionalism and passion that Dave Nelson and his staff at ASA exhibit at every visit. Hearing instruments do require periodic care and cleaning and it is important that there is a "comfort" zone with your hearing aid provider. Please accept the fact that you really do need hearing aids, and the combination of Dave Nelson and ReSound is highly recommended. Dear David and your wonderful staff, thank you so much for everything on Wed. Sept. the 10th. The presentations the food and of course your wonderful smiley faces. You are the best! Dr. David & Team - Thank you again for the great presentation on Wednesday. All of the info. was helpful to me & my Amberleigh staff. The favors were adorable, the food sincerely delicious and the cookies "looked" yummy. You're all appreciated. Oh, and the pleasant smelling goodie basket was an unexpected treat, so sweet of you. Merci! 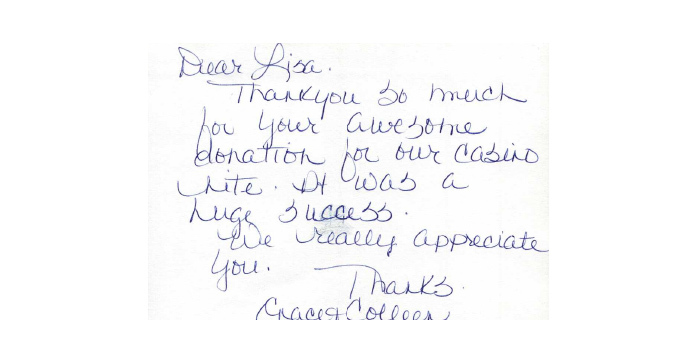 Dear Lisa, thank you so much for your awesome donation for our casino night. It was a huge success. We really appreciate you. Thanks.